In the early 1800s, trade in furs flourished in the American west, based mostly on beaver pelts, used to make the tall, shiny hats of well-to-do eastern gentlemen. At first, the trappers themselves transported these furs from the Rocky Mountains all the way back to St. Louis, Missouri, where the furs were sold or traded for supplies and equipment needed for the coming year. In 1825, the traders figured out there was a lot of money to be made by transporting trade goods to the mountains and trading there for the furs. The trappers, whom we call Mountaineers or Mountain Men, were quite agreeable to this, since many of them preferred life in the wilderness and didn’t much care for the long trip back east. 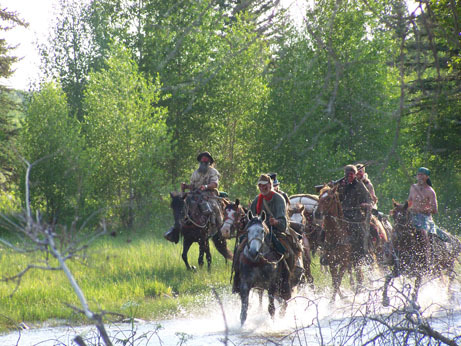 These annual summer gatherings were called rendezvous, and were held at a designated spot known to both trappers and traders. While these rendezvous were intended as a business arrangement, they soon became the trappers Christmas, New Years Eve and birthday party; a general-purpose annual blowout and trade fair. These rendezvous came to an end about 1840, due in large part to the depleted beaver population in the Rocky Mountains and the changing fashion in hats. 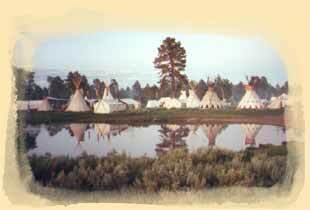 The Rocky Mountain National Rendezvous (RMNR) is an annual celebration of life on the pre-1840 American Western frontier. 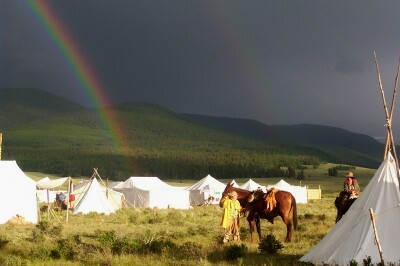 It is part re-enactment and part living history, based on the fur-trade rendezvous held in the Rocky Mountains. The RMNR does not require membership in anything, our only requirement is that participants abide by our simple rules, and join in the spirit of rendezvous. We have access to private land for our events and endeavor to leave them more pristine than when we started. Come and join us if you are interested in the history of the Rocky Mountain Fur Trade era and re-creating some of the most interesting and exciting times in our American Heritage.